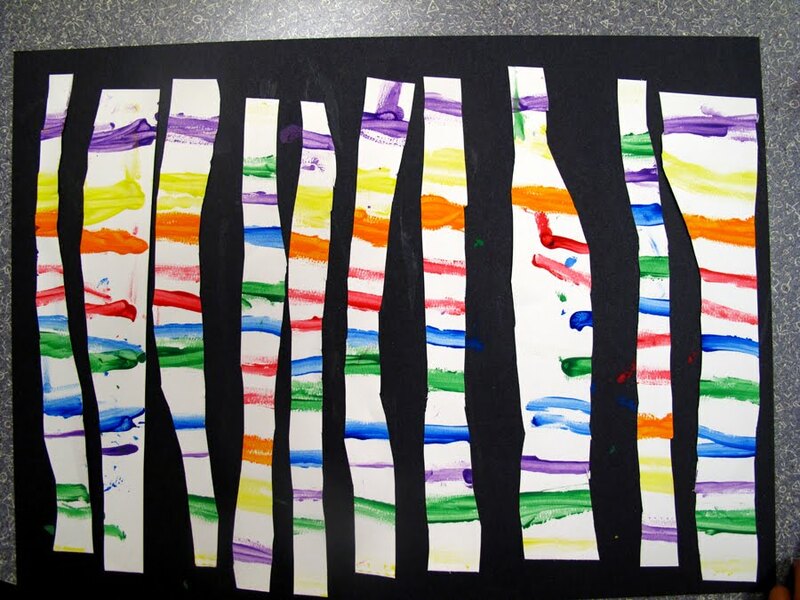 Children ages 3-5 helped me explore the OKCMOA to find stripes. 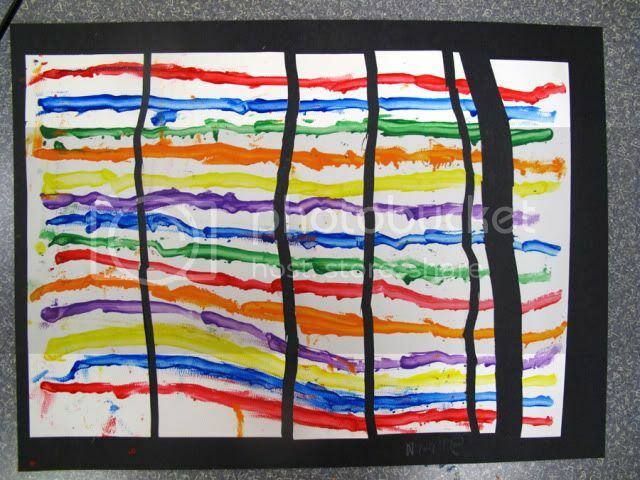 First we talked about lines. Lines are all around us. Then we took a look at a few books to find stripes. Simply put for them, stripes are lines that are next to each other. The class is only an hour so we had to get busy. 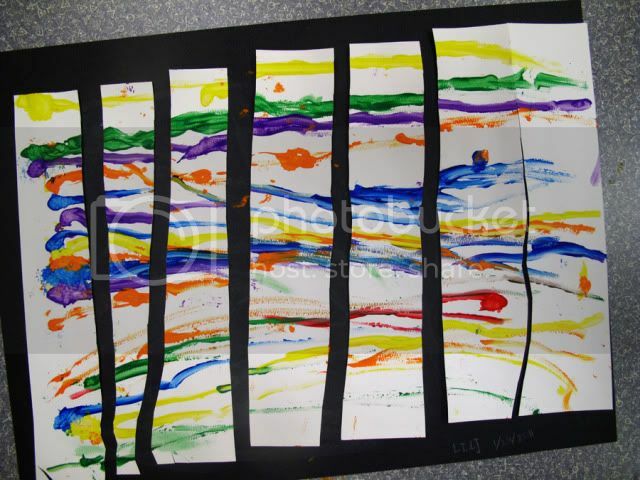 Each child had a paper plate palette with several colors of tempera paints to choose from. I supplied q-tips, one for each color. 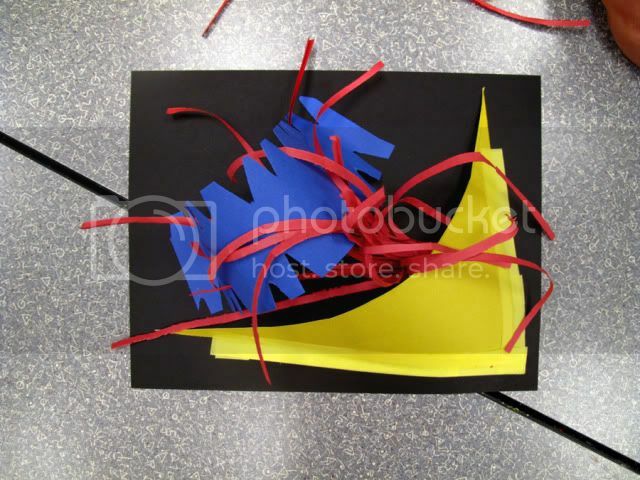 Q-tips work great for some projects because they are quick and disposable. 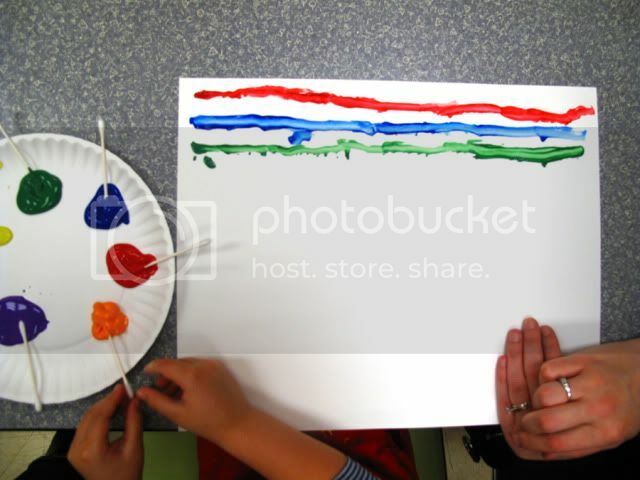 If we had to wash a brush between all the colors it would have taken forever. 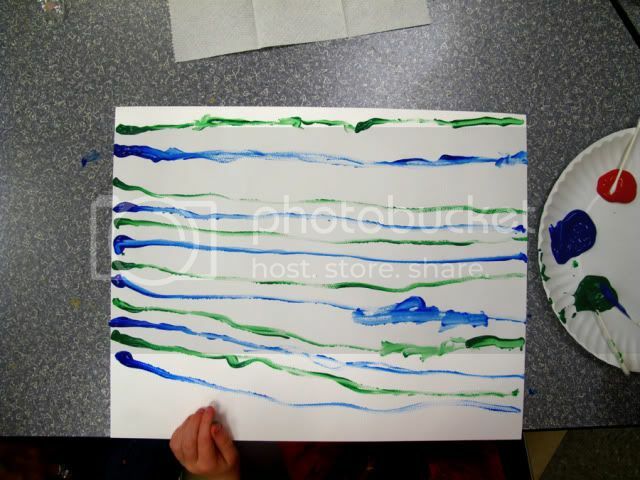 We paint horizontal stripes with our paper set horizontal. 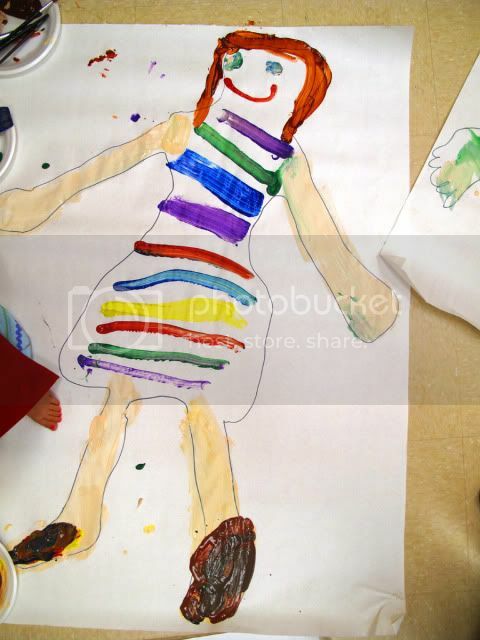 I encourage the children not to mix colors at this point, but to put the colors in any order using whatever colors they want. 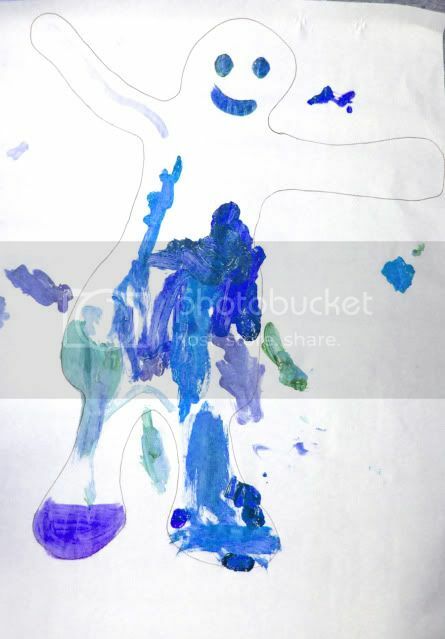 This child only used two colors. He was proud that he was making a pattern. 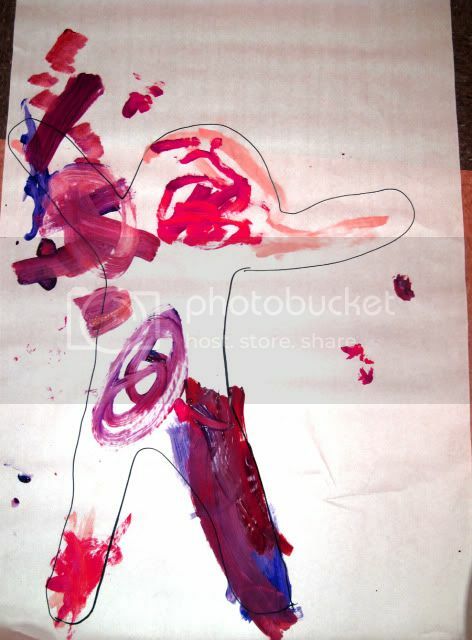 We left our painting to dry while we left the classroom to explore the galleries. We viewed several works taking a closer look at pieces by Frank Stella and Gene Davis. We played a game of I Spy and went back to the classroom to create a new piece using our original painting. 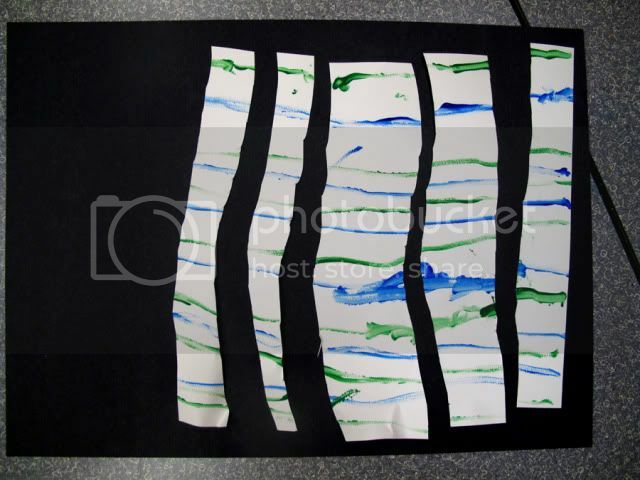 Here we cut our paintings into more, you got it, stripes! 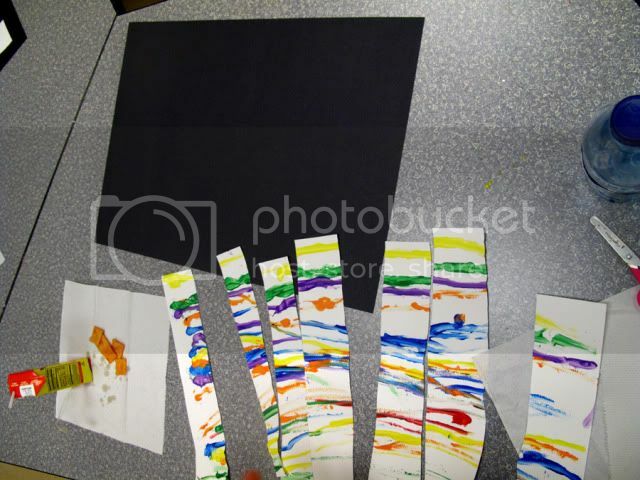 We use glue sticks to put our strips of paper on black tag board leaving space between each strip in order to create yet another stripe. 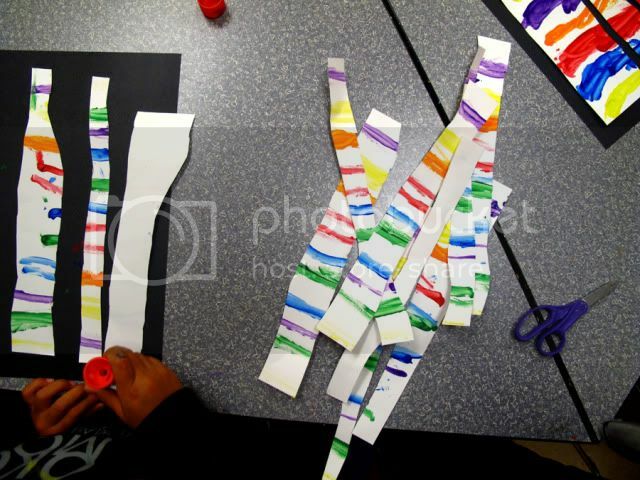 I tell them they can lay the cut strips of paper down in whatever order they wish. 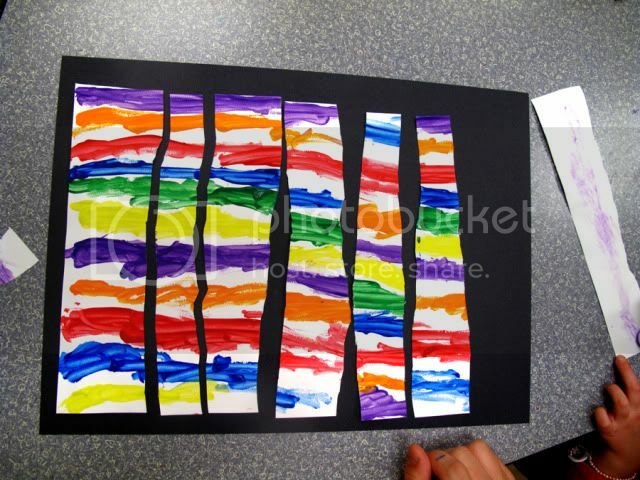 Some left them in the same order as they were cut and others turned pieces around and mixed it up. 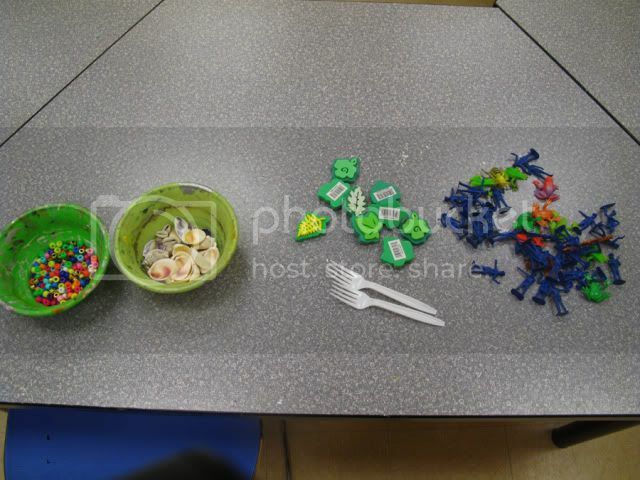 Great use of fine motor skills today for these kids! p.s. I have some pretty exciting news to share with you soon! Today at the OKCMOA I shared two kinds of sculptures. 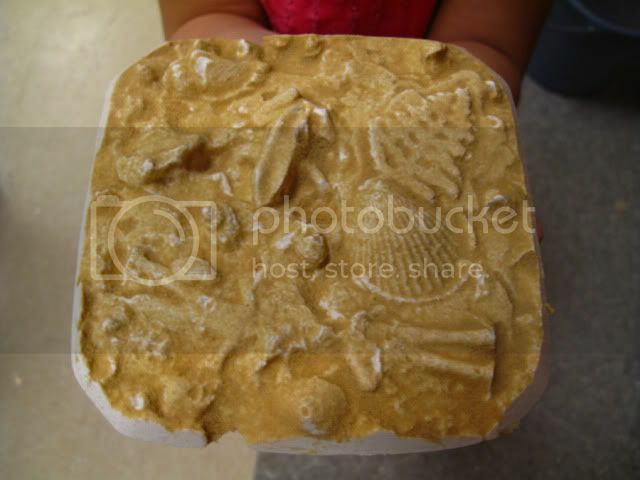 We made relief and 3-D sculptures. They are turned out wonderful! 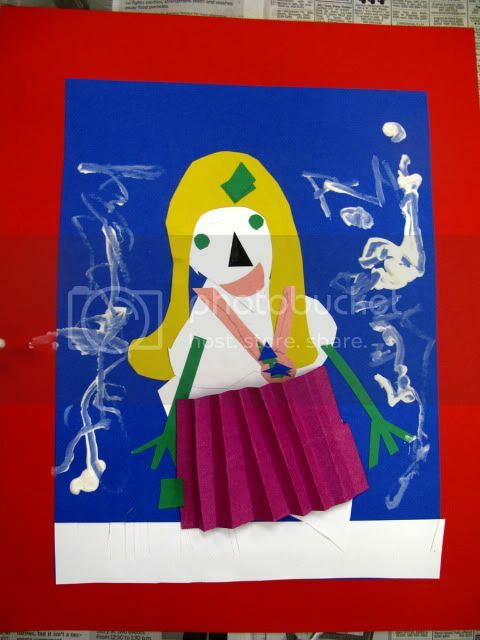 This is a project your children will love and an idea you can incorporate with different school subjects as well. Not only is it fun for fossils and Science, but many sculpture artists use molds to create their works and this is an easy way for children to learn about how that is done. 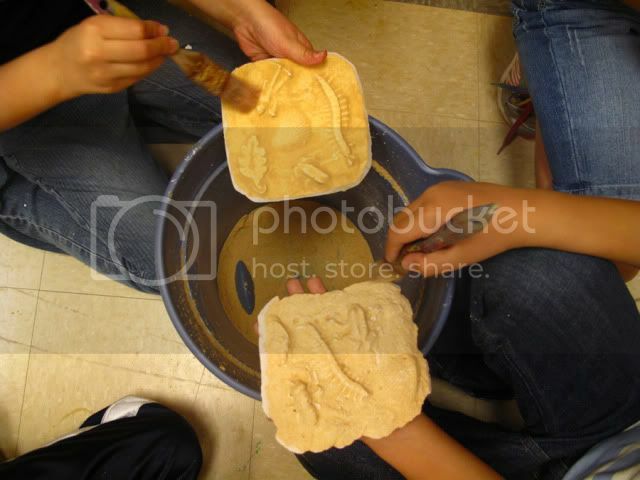 First we started with the relief sculptures. 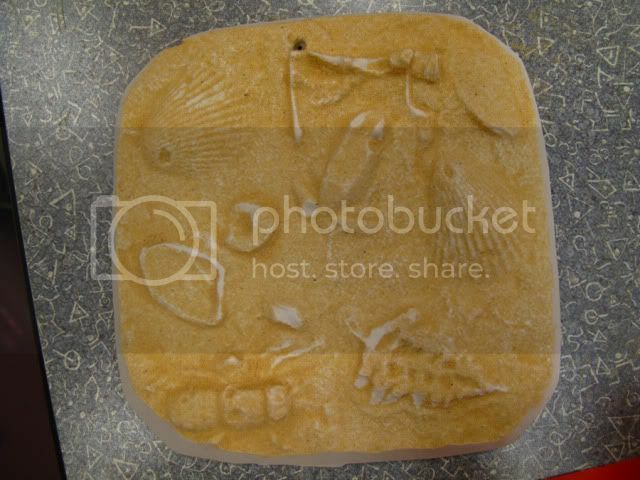 We accomplished these by sand casting, or making molds in sand. 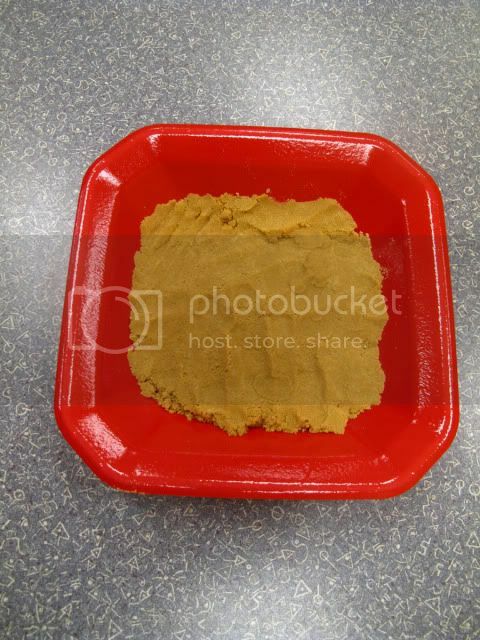 First we start with damp sand in a dish. 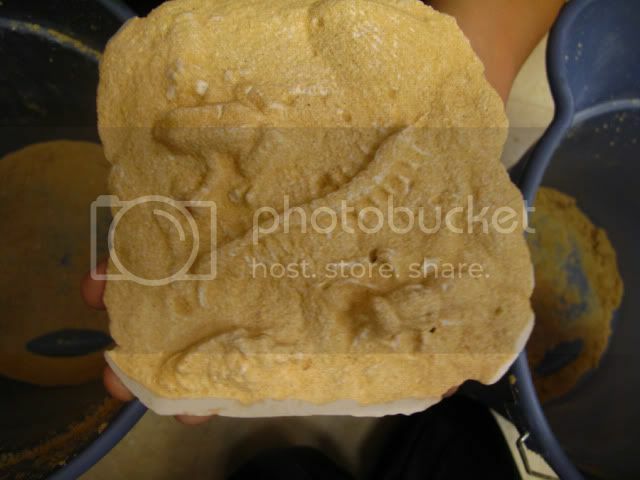 The sand needs to be a little wet so it will take the imprint of the object. 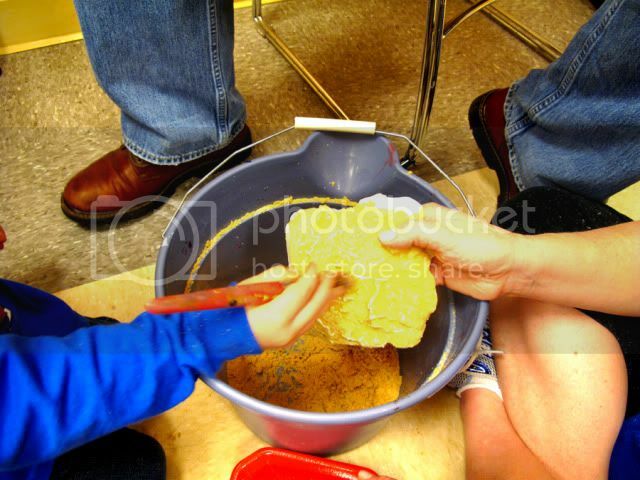 I told the children to smooth the sand with their hands and choose objects that they wanted to mold. 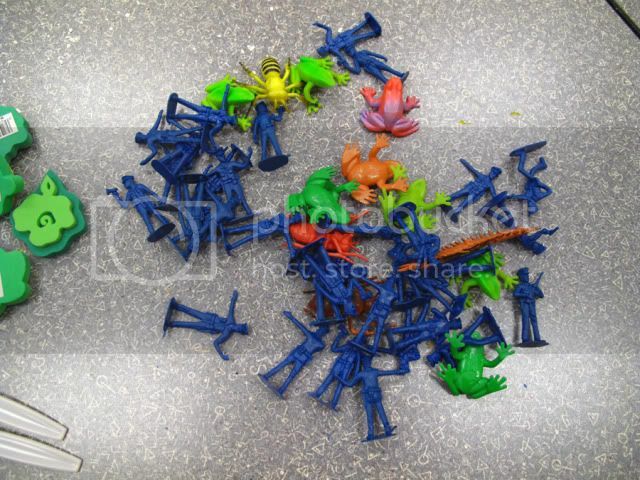 I had a variety of items; little plastic bugs and army men, pony beads, shells etc. You gently push the item into the sand and remove it. 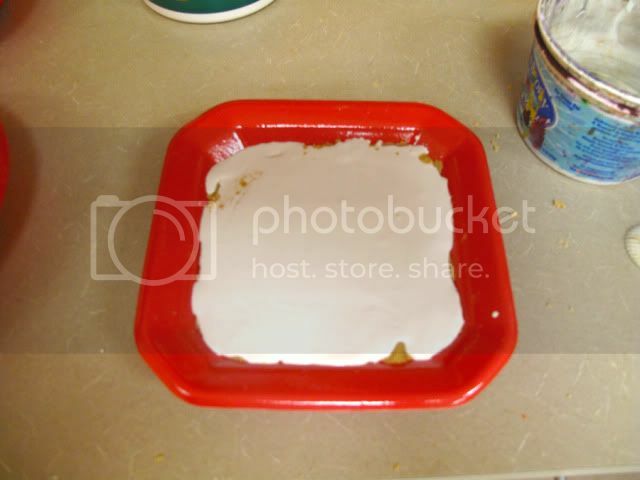 Then I mixed the plaster and poured it over the sand tapping the dish lightly to remove any air bubbles. NOTE: NEVER PUT PLASTER INTO A SINK. 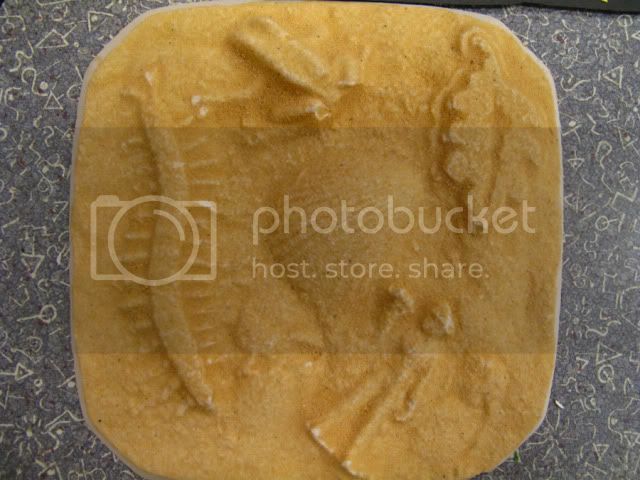 I have several portions of plaster measured out so all I need to do is add water and have the kids start mixing. 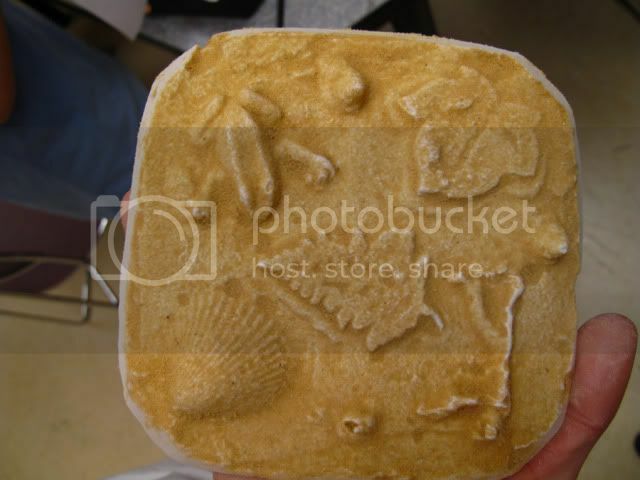 The molds need to sit for 30 minutes! What do we do for 30 minutes? 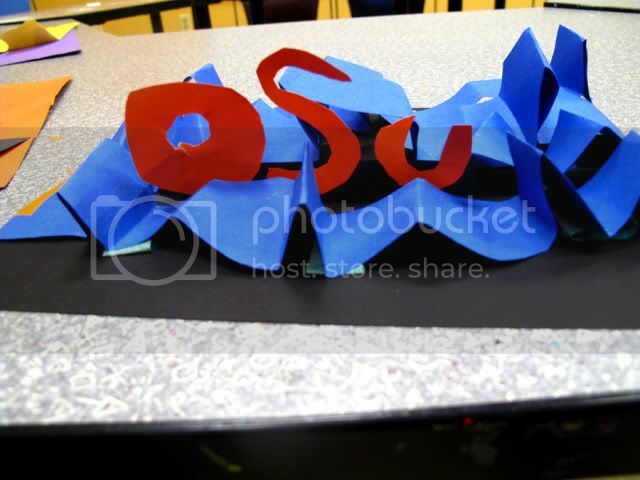 Make more sculptures! 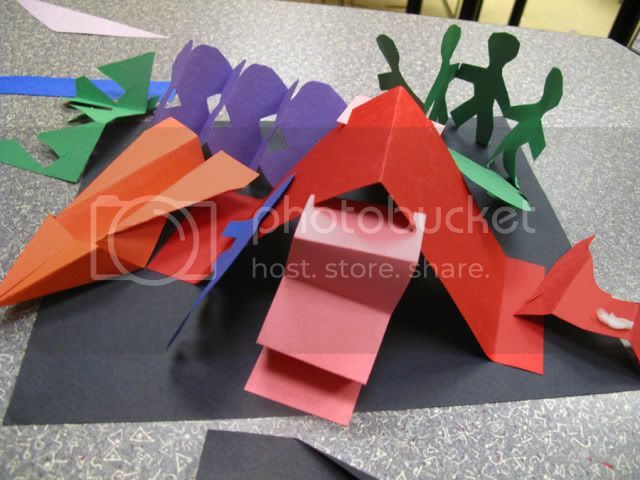 We talked about 3-D sculptures and used scrap paper to create them. 30 minutes is up! 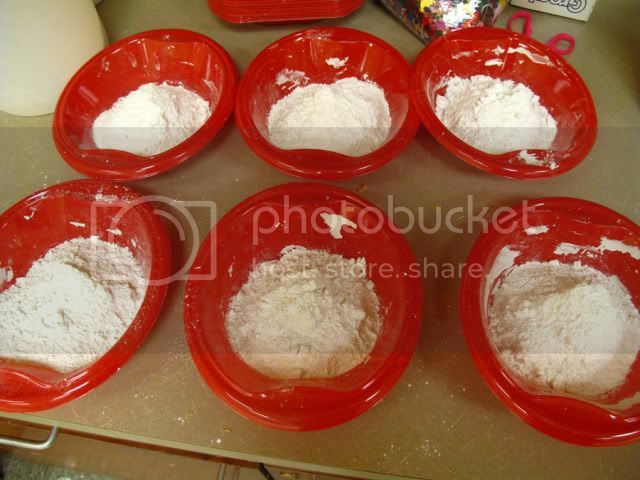 Let's check on our sand castings. They are ready! 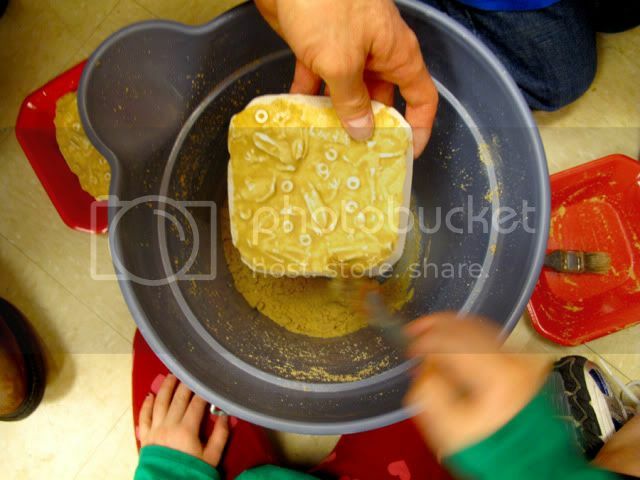 Gently unmold over a bucket or box, whatever you have on hand. You can re-use the sand. 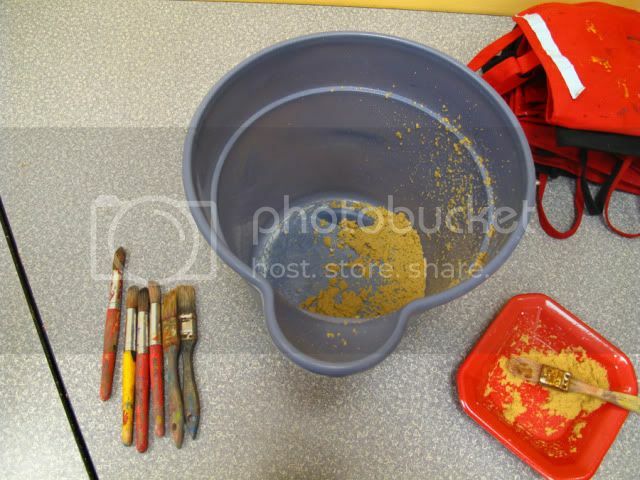 Use your hands and then a paint brush to lightly brush away the sand away revealing the items you pressed in the sand. The kids were amazed! This is a class I did some time ago but logged it away for another day. 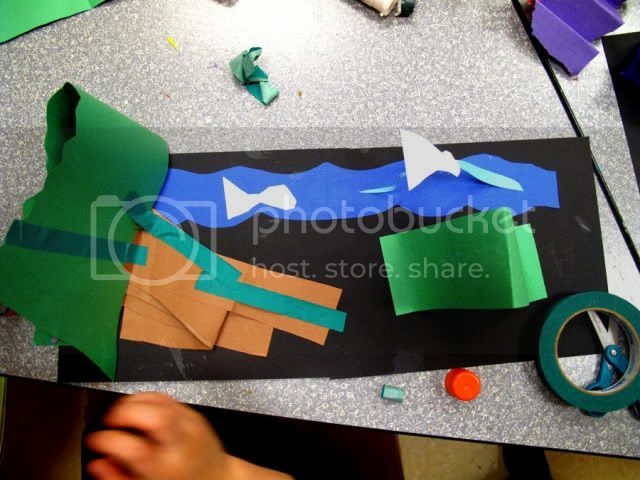 I remember doing this in school when I was younger. 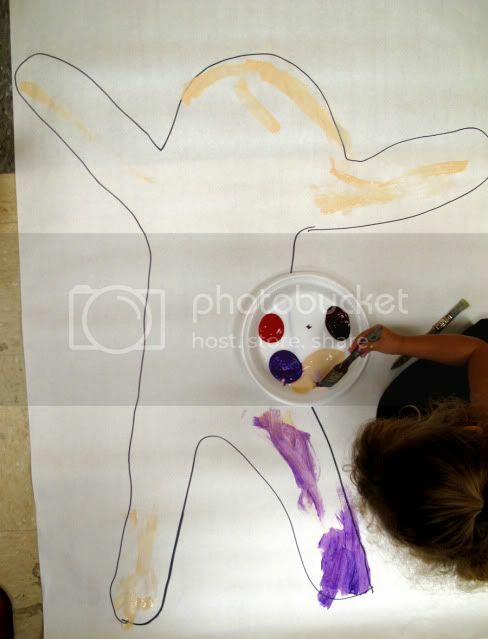 Not a new idea, but so fun and the kids love seeing themselves life size! Do you have a roll of butcher paper? This is the perfect project for you! 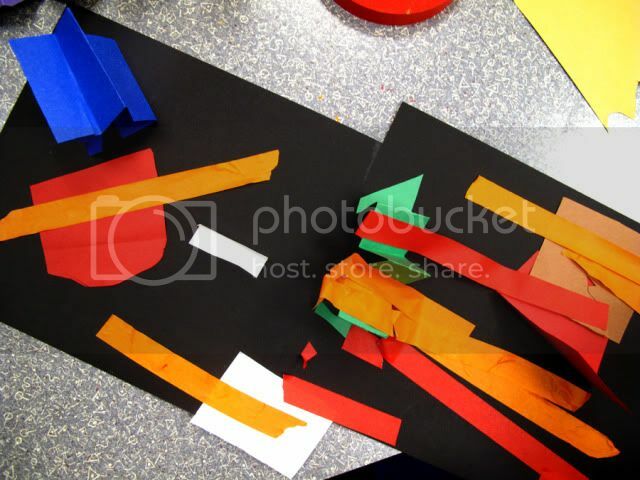 This class was for kids ages 3-5 years old. 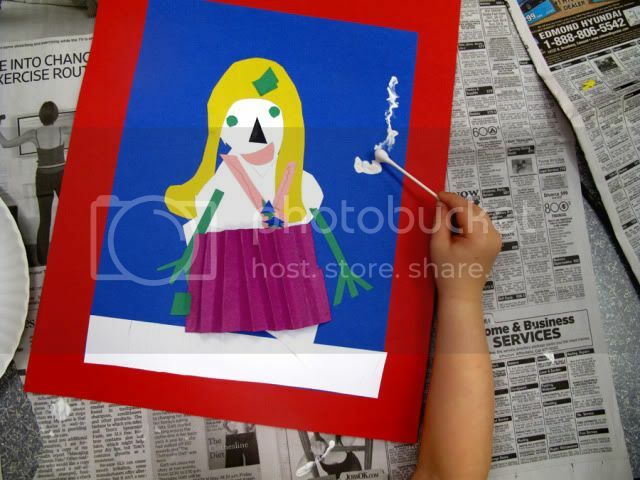 After we read our story and visited the gallery we got busy. I had sheets of paper on the floor for everyone. 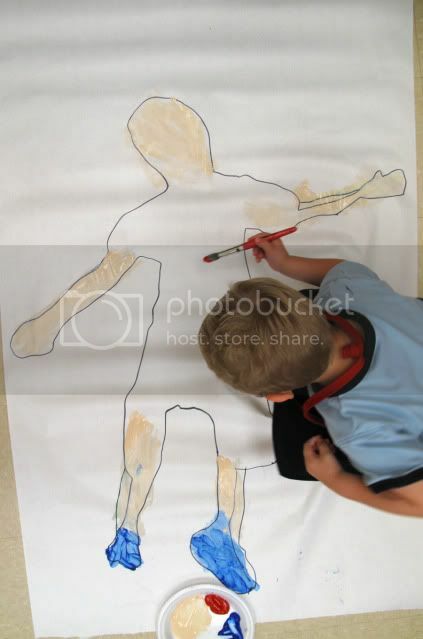 Each child laid down on the paper and was traced by an adult with a marker. If you are doing this at home, have siblings trace each other! 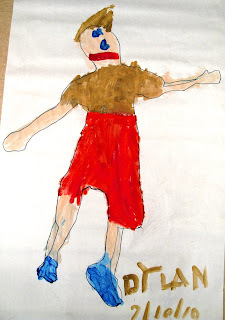 The younger ones focused more on selecting paint colors that portrayed how they felt while older children painted in their outlines to the likeness of what they were wearing. A great book discussing color and feelings is My Many Colored Days by Dr. Seuss. 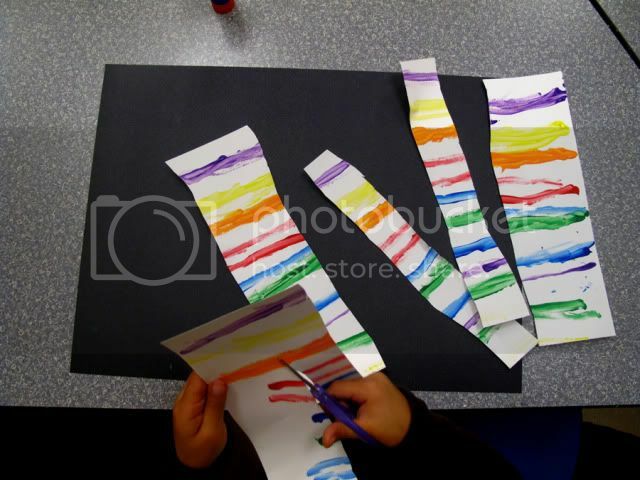 One step further: My classes are one-time and only an hour long but if I had more time I would have put another sheet of paper on the back, cut out both, stuffed with paper and stapled them closed around the edges. Do you have a FB page? Let me know and I'll like ya back! 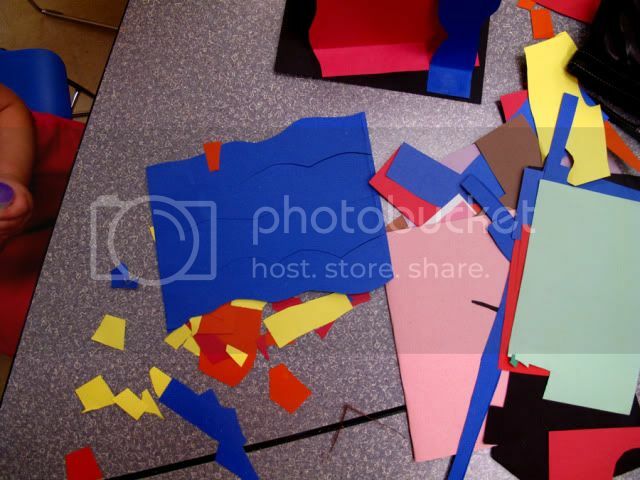 Today I got to share this fun project with children at The Oklahoma City Museum of Art. It is part of the Tiny Tuesdays program that I am so happy to be a part of. We had a great time today creating these personalized silly snowmen. 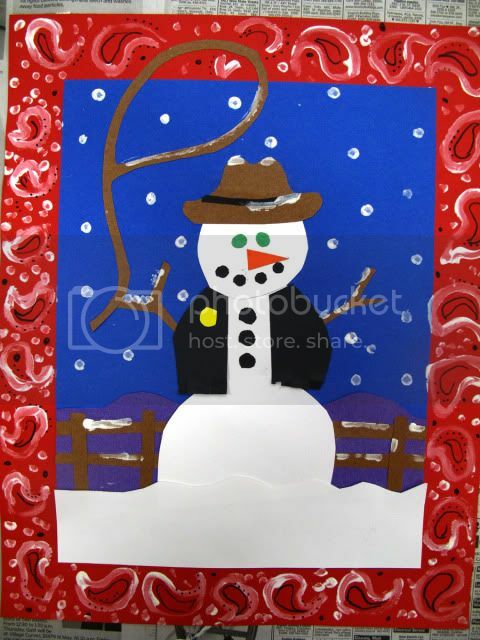 Snowman collage is not a new idea but adding a little tempera paint and a bright color of paper to mat the picture might make this old project new to you. 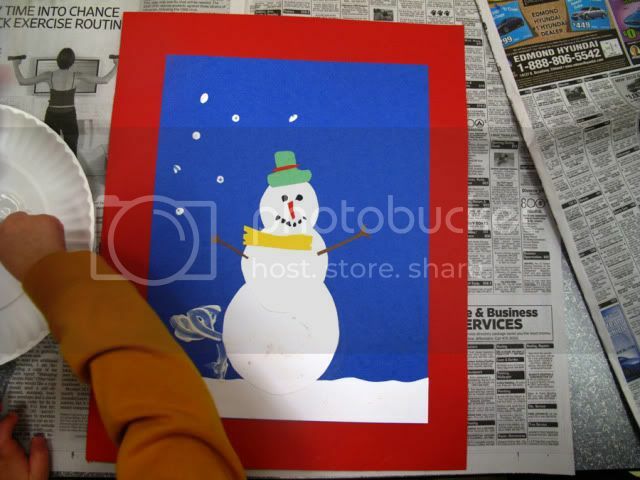 I did not give any templates or specific instructions on how to decorate the snowmen. 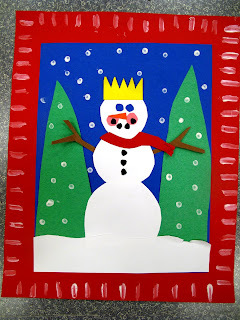 We discussed how to make the snowmen unique through things a silly snowman might wear or use. 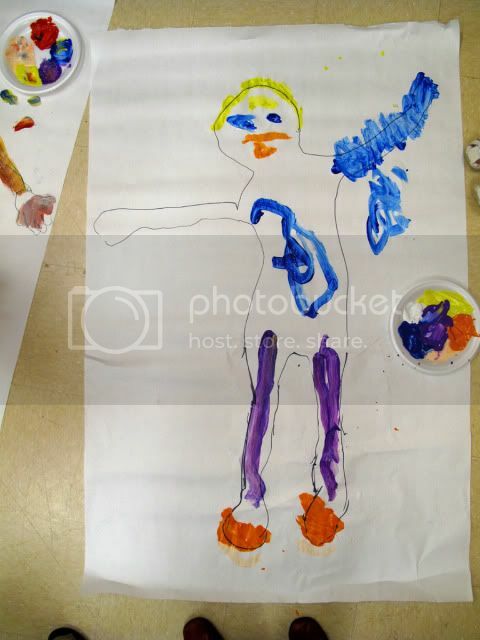 We discussed things to find on a face and items to wear on the body. 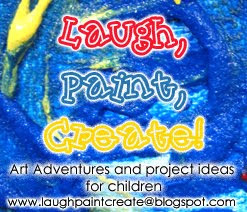 The children had fun! 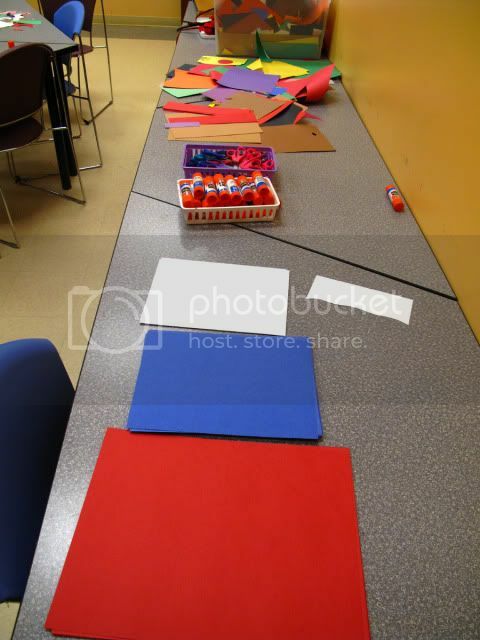 First we glued our blue paper on our larger piece of red paper. 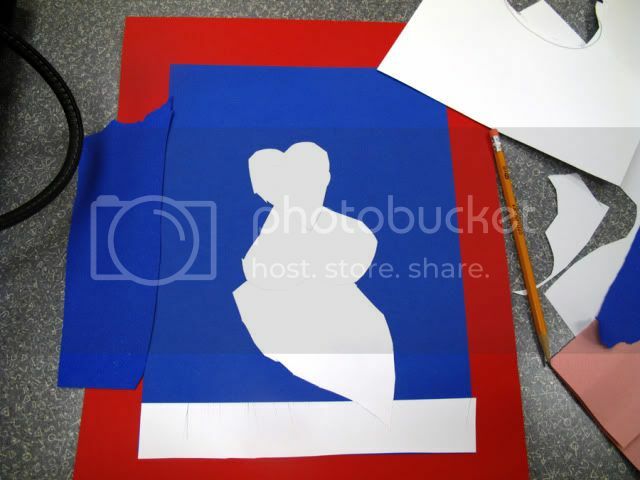 Then we cut white scrap paper and glued it at the bottom of our blue paper. This grounded our snowmen. 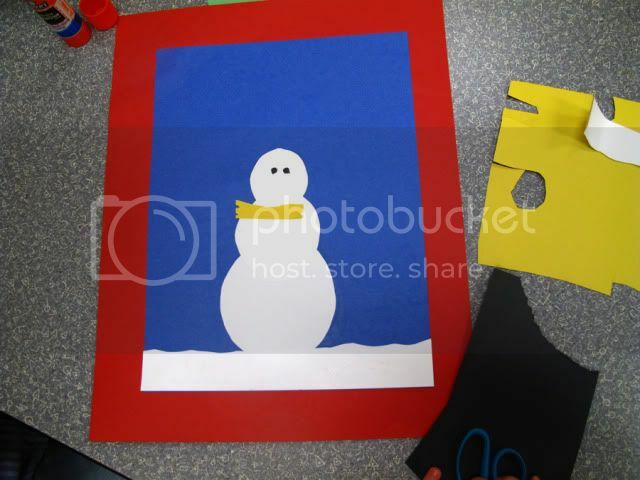 After that we cut our snowman shapes and used more scrap paper to decorate our snowmen. 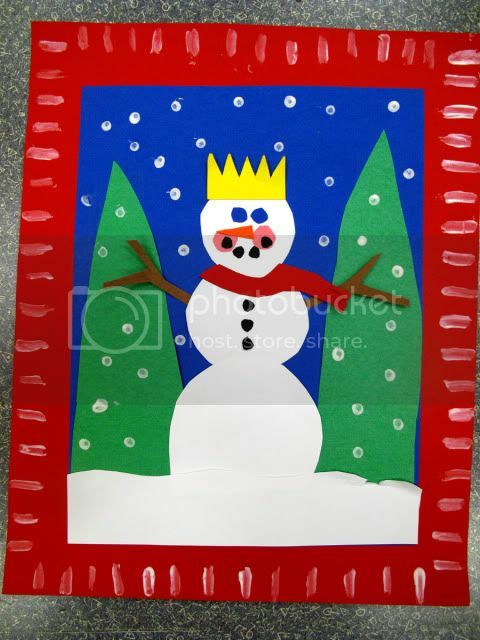 See the top of this snowman? It's a heart and that I love this wonderful personal touch! That is part of the fun not using pre-cut forms. 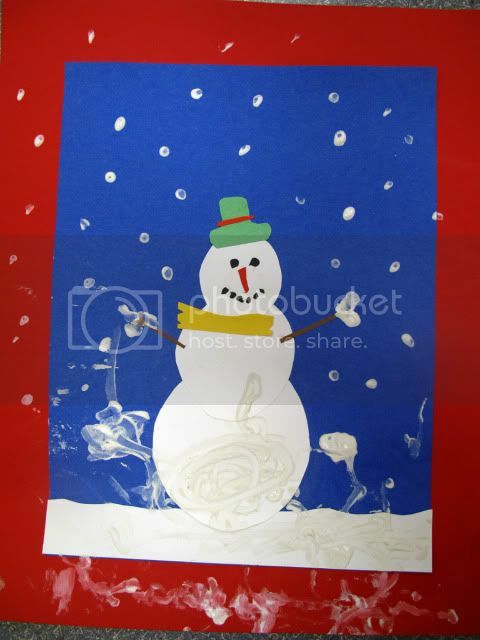 When the collage was finished we used white tempera paint and q-tips to add snow!